Being a black woman in the UK and working in a corporate environment most of my life has been difficult. For years, I’ve been told I’m too aggressive for having an opinion, not business competent or told that I’m suited to management roles but not “director material” – glass ceiling much! On countless occasions, I’ve been left to feel isolated from work “banter” and sometimes even career opportunities for not attending every social event. (I’m not a pub girl anyway, give me a wine bar any day darling *flicks weave*). But on a serious note, when I look to those people who doubt my work ability, they don’t look like me. Little do they know that I have already co-founded a successful property business portfolio while juggling a full-time job and a young family. I knew what the problem was but just didn’t want to admit it to myself. I still wanted to believe I lived in a fair and democratic society. But the truth is I don’t look or sound like the status quo. From working in these corporate environments, my sister and I decided to enter into the world of beauty. Despite my lack of direct knowledge of the beauty industry, I knew I wanted to create a space and a working environment that allowed us to just be. As a black woman living in the UK, I have shared an array of similar experiences to my peers when it comes to beauty. You don’t have to be a marketing expert to know that we, as a community, spend a large amount on cosmetics. In the U.S, African-American women spend around 80% more on cosmetics and twice as much on skincare than the general market. Yet in spite of all this, we’re still lacking spaces that celebrate black British women in the world of beauty. That’s why I set up Shades of Beauty Live, the hair and beauty show catered to black women. We’re passionate about challenging mainstream beauty standards whilst promoting the idea (within the black community) that there is no one way to be black. Beauty comes in all shades, shapes and sizes, whether you rock natural hair, weave or a polished head! We are a small team full of passion and ambition. We are not only looking to grow successful events for the community but we’re also hoping to cultivate healthy working environments where women, especially black women are at the forefront. Let’s be honest: we all know that black women are the innovators. Whether its hair, fashion or general style, we don’t follow trends – we set them! Yet, although we are a community of trendsetters we still aren’t valued by the beauty industry. During our time organising the show, we have approached many mainstream brands on the high street who have turned down being part of the event for many reasons but mostly because they simply don’t have any plans to create or participate in experiential marketing campaigns targeted to this demographic. Surely black women deserve a big platform where we can come together to share, learn and discuss things that concern us specifically? 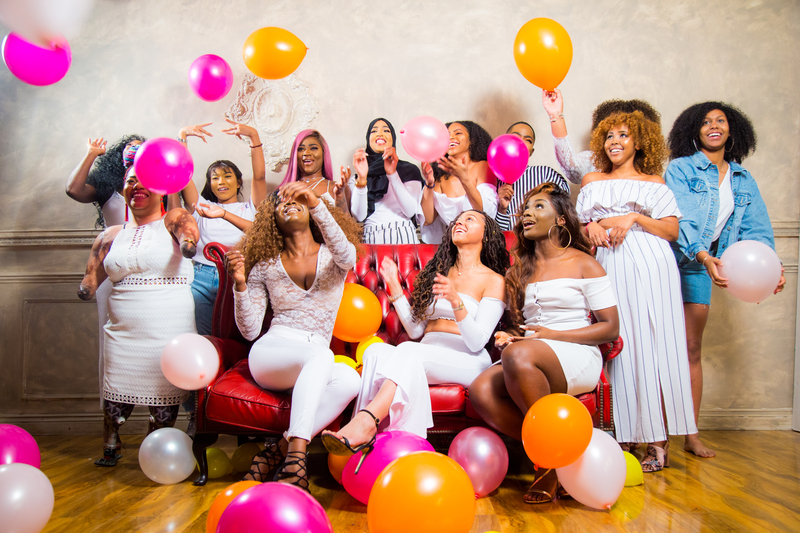 More and more women of colour are launching brands online offering diverse product ranges. We want to bring these brands to life by giving them, as well as the traditional bigger brands, a space to meet with their customers and introduce themselves to new ones. The digital space is great, but there’s nothing like a real-life connection. Shades of Beauty is all about bringing the online offline and offering a physical space to meet. It’s time for a new narrative. Not just something we talk about or ‘like’ and ‘share’ on social media, but something tangible where we create the change we really want in the industry. Not just a seat at the table. How about a table where everyone appreciates one another as equals and all voices are heard and appreciated? Let’s give it a go! We don’t have anything more to lose.